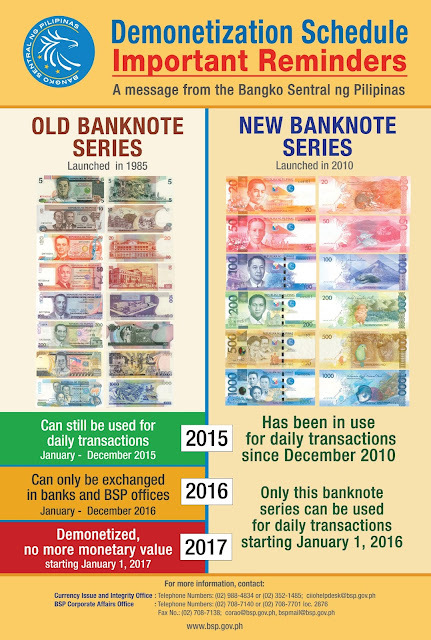 MANILA, Philippines - The Bangko Sentral ng Pilipinas (BSP) has announced the final date of demonetizing old bank notes up until December 31, 2015 and in 2016 may only be exchanged in banks or at the BSP. BSP said they have already started demonetizing old bank notes series earlier this year, which means that old banknotes can still be used to pay for goods and services up until the said deadline. After which, the old bank notes will be rendered useless and will be stripped from the current values from the Philippine banks and establishments including malls, shops and markets. The old banknote series which were launched in 1985 will be decommissioned starting January 1, 2017. In addition, The Bangko Sentral ng Pilipinas will also conduct briefings on demonetization program and information on how to detect counterfeit money for the staff of DOLE and its attached agencies. BSP be reached by their landline number 708-7140 and by fax at 708-7138 should you need additional information.